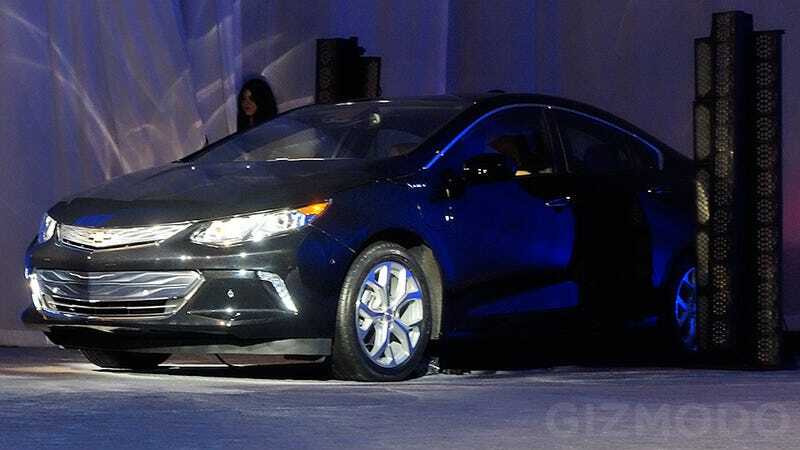 Instead of waiting for the North American International Auto Show in Detroit next week to finally unveil what the new Chevy Volt looks like, General Motors pulled back the curtain on its new electric hybrid at CES just now. No details, no other specifics, just our first full look at the vehicle. The original Volt (pictured above) was the first hybrid that was an electric car first and foremost. The gas engine the Volt carried as a backup was only intended to be used to generate electricity to charge the car's batteries once they died. The Volt was an important vehicle for General Motors that the company had spent years developing and teasing, and while the final production version didn't look quite like the original Volt concept that originally got us all excited, it still looked far more futuristic than your average family sedan.